Do you cough several times every day? Have you been coughing like this for more than three months? Do you cough up mucus (phlegm) most days? Do you feel breathless from physical work or moderate exercise? Do you or have you ever worked in an environment where there is exposure to pollution, fumes, dust or smoke? 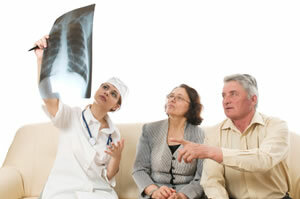 Is there a history of lung conditions in your family? COPD is diagnosed with a simple and painless breathing test called Spirometry. You will be asked to breathe as hard as you can into a machine. This measures the amount of air that you can force out of your lungs in one second and the total amount of air that you can force our of your lungs. From the results of this test you doctor will be able to tell if your airways have narrowed. Lung Function Tests indicate how much air your lungs can hold and how fast you can blow air in and out. Arterial Blood Gas (ABG) is a special blood test that gives more information about your oxygen level and your breathing. This sample is obtained from an artery and not a vein. Pulse Oximetry checks the oxygen level in your blood. This is done by placing a small probe on your finger. 6 Minute Walk Test checks your oxygen need while you walk. It also checks your capacity for exercise. Electrocardiogram (ECG) shows the electrical activity of your heart. Chest – X– Ray provides a picture of your lungs. Computerised tomography (CAT Scan) is a non invasive, painless medical test that helps physicians diagnose and treat medical conditions.